JuanaMikels.com: One Voice Sample & Janie/Tessa/Girls Update! Many of you have been keeping up with Janie and Tessa, (and Grace and Madeline) the girls that were in a horrific car accident three weeks ago today in which the car tumbled over several times throwing the girls out of the car roof and windows like salt coming out of a shaker. Tessa sustained multiple bone injuries, and Janie was in a medically-induced coma for two weeks due to a brain shear. Click here to read more about their families. We are rejoicing that Janie came out of the coma (the stone has been rolled away, as her mom called it referring to the resurrection power of Christ that rose Him from the grave!) and the other 3 girls are healing day by day. 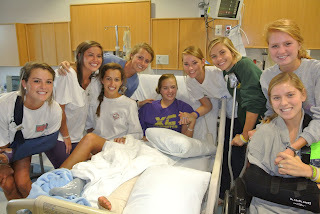 I thought you would like to see this picture taken in Janie's room (Grace on crutches, Tessa in wheelchair. I don't know Madeline...I know my sons do, but there are not here right now ☺ could that be her in the sling? Let us know if you know! I was not there when this picture was taken!) I know one thing: it shouts, "Praise be to the living Lord!" Janie is in a singing group called "One Voice," and they had sung at our church just 2 months before the accident. What rejoicing it will be when Janie stands up with them again and sing praises to her God! Click here to read Janie's mom's awesome blog! You won't be the same after reading it!